Dallas, October 26, 2009: The Texas Governor’s office in partnership with the Dallas Regional Chamber honored Triune at the “Spirit of Texas” Small Business Awards Luncheon on Wednesday, October 21, 2009 at the Sheraton Dallas. Out of 90 nominations, ten small businesses were recognized as exemplifying the spirit of Texas. Honoreeswerechosenbasedontheir contributions and involvement in the community, achievements and accomplishments as a small business, and for possessing the “spirit” that has made Texas the #1 state to do business. 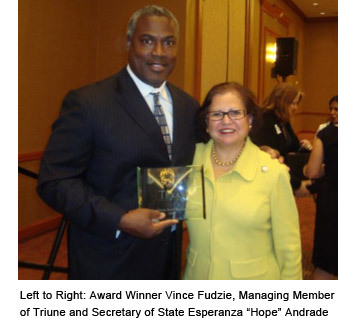 The event was keynoted by Texas’ 107th Secretary of State Esperanza “Hope” Andrade who addressed over 200 business owners, expressing her support of local economic efforts and her encouragement to maintain Texas’ small business entrepreneurial success. “Small businesses are at the heart of the economic engine that drives our states prosperity,” Andrade said.